Join the discussion on our forums! Come discuss The Curator over in our dedicated The Curator discussion topic. He's an Arcane Golem, and so is Zoobot, why do they get the mech tag? Curator! Stop releasing all the exhibits! Going to play this in the Paladin deck, looks great! This guy fits nicely into almost any midrange or control warrior deck. just toss in Fierce Monkey, Stampeding Kodo, Azure Drake, and a legendary dragon like Nefarian or Ysera and you're good to go! I've really enjoyed using him in Reno+C'thun Hybrid decks as well as tempo warrior. This card is very similar to Twin Emperor Vek'lor, I've come to realize. He's a 7-mana 4/6 Neutral Legendary with Taunt, with a Battlecry that can generate immense value in the right deck. Even if you're only drawing into a card like Azure Drake and nothing else, that's still a very good effect considering that's a guaranteed draw. At first, I was kind of dumb and thought you'd have to have a deck with Beasts, Dragons, AND Murlocs in order to get value from it. But in reality, if you're running a deck where the only thing you'll be drawing is, say, a powerful Beast or Dragon and nothing else, that's still immensely powerful. It's similar to Ancient Harbinger in this respect. I run him in Beast Druid, where he can draw me any number of Beasts, and an Azure Drake a good 90% of the time as well. ONiK's sleeper hit. The best part about this card IMO is how flexible it is; I've used it successfully in Beast Druid, Anyfin Control Paladin, Dragon Paladin, Dragon Warlock, Midrange Hunter, and Highlander Mage. Sure, not all of these decks are necessarily top-tier in the current meta, but the point is that The Curator promotes inventive deckbuilding since you are rewarded for including cards you might not necessarily use. Also, the dream of Brann Bronzebeard + The Curator is a pretty spectacular sight to witness...drawing 6 cards while getting bodies on the board is amazing! Drawing 6 cards CAN be good but depending on the deck you're playing and if by turn 7 you still have lots of cards in hand you run the risk of possibly overdrawing. but it could work the other way too i guess. Azure Drake is awesome for this guy. Draw into more draw. Yeah, right, only Dr. Boom would fit in to EVERY type of deck or class, without any condition, had an immediate effect, board control and guaranteed damage. Draw Coldlight Oracle in Mill Deck is what comes up in my mind. Having card advantage in the game can often be more powerful than buffing a few minions. Nourish draws you 3 cards for 5 mana. Playing Nourish to draw cards on turn 5 means you're not having any impact on the board that turn. 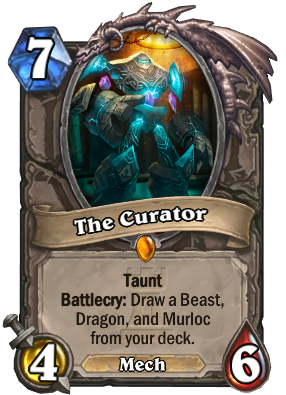 The Curator can draw specific cards and has immediate impact on the board (it's a taunt). Drawing a card has a huge value. Drawing three cards is immense. Drawing 1-3 cards and knowing what you'll draw? Hee-hee hoo-hoo hah-hah.